Forays into grain experimentation continue… this time with barley crackers. I used a recipe from The New Laurel’s Kitchen by Laurel Robertson, Carol Flinders, and Brian Ruppenthal. 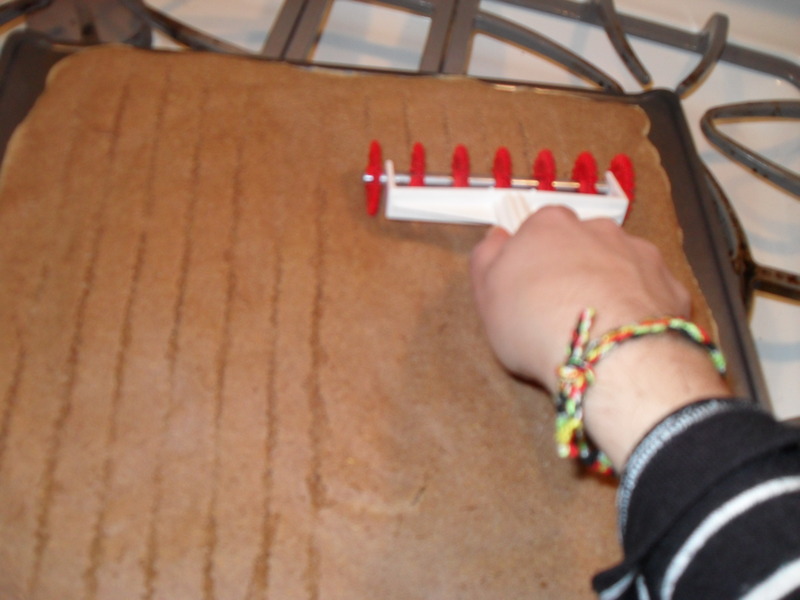 Grease a flat 12″ x 18″ cookie sheet or the back of one with sides. (The crackers will stick otherwise.) 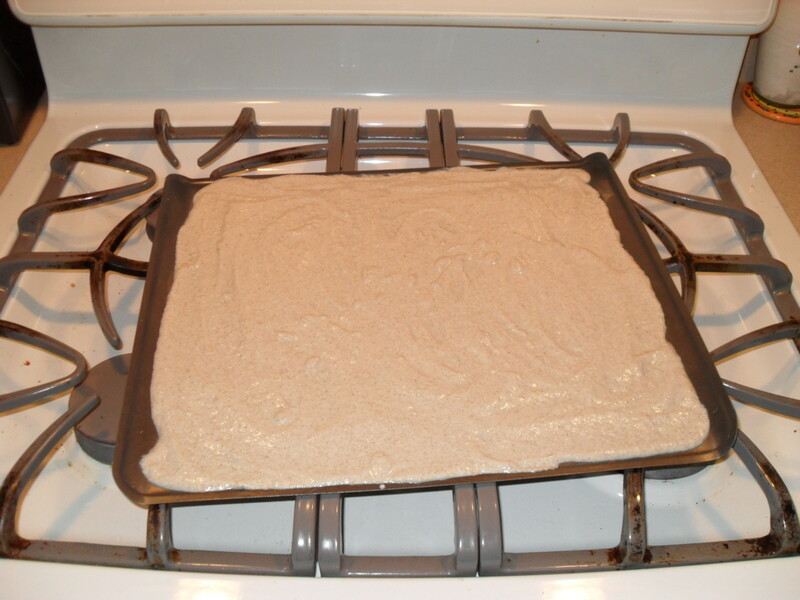 If you want them especially thin use the same amount of batter on two sheets. Sift the flour, salt, and soda. Stir in the buttermilk. Spread the batter on the cookie sheet(s) as if it were frosting on a cake, making it quite even. Bake at about 350°F until very delicately brown. About halfway through the baking–some 10 minutes along–score the dough in squares or rectangles or whatever you like, so the crackers will break apart easily when they are done. So that seemed straightforward enough. Right? I milled the barley (from my CSA share through Pioneer Valley Heritage Grain) in my grain mill, added the other ingredients, and spread the batter all over a greased cookie sheet. Now, at this point, the savvy ones among you will notice that this cookie sheet is the wrong size. Did I notice? No. More on that later. I baked for the suggested 10 minutes, pulled the cookie sheet out of the oven, and decided to try to score it with a tool called a pasta bike. It was the first time I had pulled that particular tool out of the random-kitchen-implements drawer. 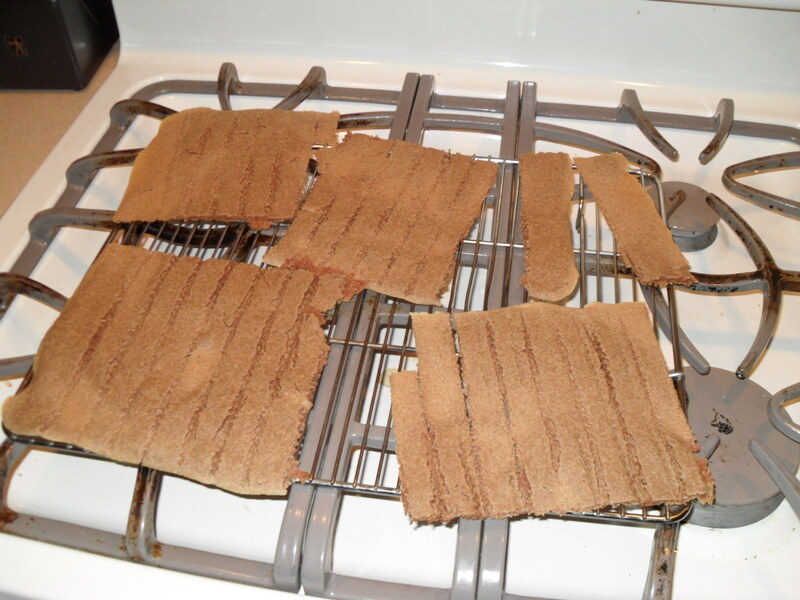 Then I finished baking the crackers, let them cool a bit, and tried to break them apart somewhat. They didn’t seem all that crackery to me either. For starters, they weren’t crunchy, except for the bits closest to the edge of the cookie sheet. The batter wasn’t spread thinly enough. The size of the cookie sheet probably came into play. Next time I should use two cookie sheets with the same amount of batter, and maybe they will be thin enough to be crunchy. Also I wasn’t happy with the way I had scored them. Maybe the pasta bike would have worked better if the batter had been spread more thinly, but still, next time I’m planning to use a knife. Despite the lack of crunch, they were still very tasty. Freshly milled barley, even when the recipe goes awry, apparently makes all the difference! « Whole wheat focaccia with thyme. Adrie, thanks for the recipe. I’m going to try it! I’ll probably omit the honey/molasses; hopefully that won’t significantly alter the potential success of the recipe. Carla, wow, I’m glad I can be an inspiration for you, since you are such an inspiration for me! I don’t feel like I’ve done anything impressive but I’ll try to take it in.